A rollicking story of imprisonment and escape during the Civil War seems a stretch, but journalist Carlson accomplished a similar feat with a Soviet premier in K Blows Top: A Cold War Comic Interlude Starring Nikita Khrushchev, America's Most Unlikely Tourist (2009), and this is another entertaining, occasionally gruesome account. The author describes how New York Tribune reporters Junius Brown and Albert Richardson covered the war for two years until Confederate artillery sunk their boat as they tried to sail past Vicksburg, Miss., to join Gen. Grant’s forces in May 1863. Confederate troops rescued the survivors. As civilians, they were paroled in Vicksburg until Confederate officials, knowing the two worked for the abolitionist newspaper, reconsidered. Protesting loudly, they traveled with other POWs by train across the South to Richmond to spend nine months in the notorious Libby and Castle Thunder prisons, furiously pulling strings for their release, sharing the soldiers’ experiences but shielded from serious privation by an apparently steady source of money. In February 1864, they were sent to the far worse Salisbury camp in North Carolina, where they watched with horror as Union prisoners, with no shelter and little food, died by the thousands. Finally escaping in December, they walked more than 300 miles, hungry and freezing, through snowy mountains to Northern lines in Tennessee, aided by a surprisingly large number of Union sympathizers, black and white. Being journalists, they had plenty to say about their exploits. 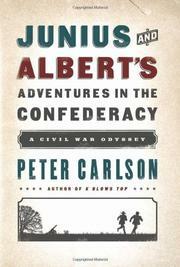 Carlson has taken full advantage of abundant material to deliver a vivid chronicle of two working Civil War reporters and their spectacular odyssey.